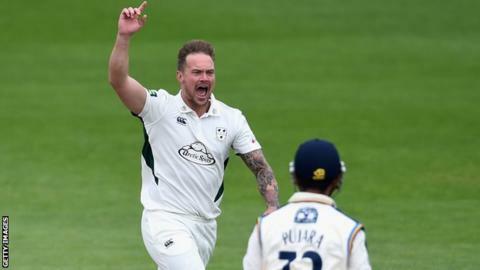 Injury-hit Worcestershire all-rounder Gareth Andrew has been released after the county decided not to renew his contract. Andrew, 31, missed most of last season with a fractured bone in his back. He returned fit for the start of this summer, playing in the county's first two Championship games, but has since been sidelined with a knee injury. "I've loved eight seasons here but the last few years have been hugely frustrating for me," Andrew said. Andrew, who started his career with Somerset, is hoping he can find another county once he regains his fitness. "Worcester is where I call home now and I am gutted to be leaving but it's the start of a new chapter and I've got the rest of my career ahead of me," he added. "I look forward to being fit in November which will allow me to take part in a full pre-season programme elsewhere." In total, Gareth Andrew he has taken 231 first-class wickets and scored 2,909 runs, hitting 17 half-centuries. His only ton is an unbeaten 180 for Canterbury against Auckland in December 2012. His career-best figures of 5-40 came against Glamorgan last summer. He hit one century for Worcestershire in one-day cricket - 104 - against Surrey at The Oval in 2010. Since joining Worcestershire in 2007, he has managed only one full Championship campaign - in 2011 - when he helped the county stay in the top flight. He started 2014 impressively taking 20 wickets in four games before breaking down with a back problem. He returned to play as a batsman only in three one-day games later in the summer. Andrew struck 59 and took 5-85 in the first innings of the opening match of this season against defending champions Yorkshire, and hit another half century in the next game against Sussex, who had tried to sign him in 2010.